You made that? It's amazing! can't take all the credit, worked with talented animator and musician to bring it to life. Now I want a kart playlist. One of the rare times when looting a teammate is the way to go. A team closed the top buncker door with caustic gas while they fought another team. They knew we came cause we triggered the gas. My team backed up and I went in through the gas and killed them with the wingman. Feeels so goood. Wow, this is awesome. Great idea. This game is the best but also the worst. I had a series of terrible games, crazy lagging, then games where I couldn't find a weapon and then a great win with randoms where I broke my damage record (1400+) and then just after, disconnected and I can't reconnect right now. Edit: Shoutout to my teammates, sorry I couln't accept the invite. Picking up loot feels slower lately and doesn’t feel as snappy. Also, placing Pathfinder zips seems slower to lock into position. Wonder what the deal is with this and if it’s network / lag based. Like right now am done with battle pass, not getting any package is so stupid. Nothing to look forward to. Haha. Got to love the slow mo bug. It makes it an interesting challenge at least. I still have faith in them. Season 2 is the last chance they will have to show what they really have, if nothing amazing is there by that time then I am ready to give up. Well Star Wars is single player and no MTX, so hopefully once it's finished and patched it won't take too many resources, and Apex can get staffed up again. First time playing in a while, friend + me + rando = 15 kill game (me, 8, friend, 5, rando, 2). What's worse than a thirsty jumpmaster that goes straight for the ship? One that misses the ship entirely and dumps you in the river. Funny to see all the wingman in hands of the good teams, extra funny that Dizzy who is 1 of the best players in the tournament have JUST wingman and 300 bullets, that should tell enough about the balance of wingman. It's pretty clear the devs didn't intend people to play the game in a organised fashion like this. Same for every other Battle Royale, it's decided by the marketing department. If a game wants to be an esport it has to be driven by the devs day 1 like CS/DOTA/LoL/SC/fighting games. Even something like Overwatch, which has a fine team format, isn't balanced well with the heros or map types. I hope they don't try and balance around the play patterns of tournaments like this because it more than likely would make it worse for people who are just playing normally for fun. In the first session, one of the team won a round by giving their lifeline all of their heals and he won outside the zone. I was watching the team that ended 2nd. Lmao NRG with Dizzy had gotten so far ahead by the second qualifier second place couldn't catch up. Insane he was just deleting ppl every round. season 1 ends june 4th right? Wrong. June 18th it is. Two more weeks for this awesome battlepass! ARE YOU NOT ENTERTAINED? Refreshing to see different strats in the tourney with people actually jumping across the map and not Skulltown. 10+ teams left at round 5. Because there is reason to try and win. 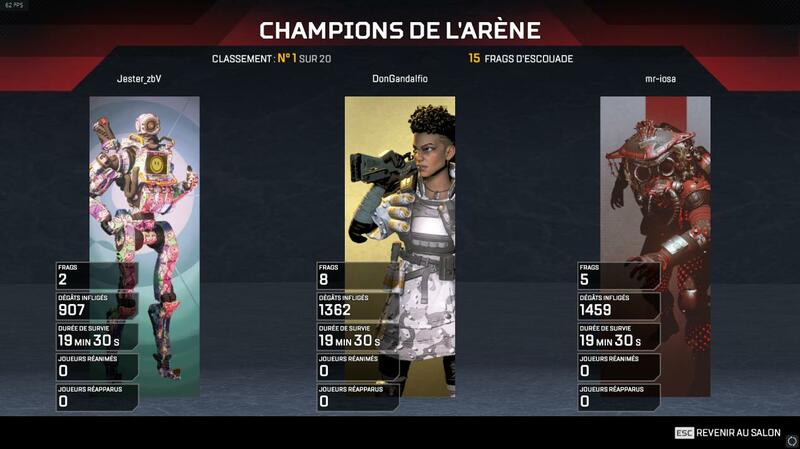 In typical Apex round there is no reason to try and win, there needs to be some reward that makes people want to win to change the whole drop asap meta. Yeah, I don't see what would be so bad about getting a pack for a win, they could even limit it to one a day or something. Or a bit of crafting materials. Could push enough to make people even try to win. Or at least let us buy skins with XP currency. Even if it’s 50k. And get more XP for wins of course. I get that you want more rewards but I’m pretty sure it has to do with skill level of opponents. Top streamers on pubs all drop immediately and win most of the time anyways. If they knew opponents weren’t scrubs they wouldn’t do that. Also the fact that they’re limited to 3 matches rather than unlimited hot drops per hour. This would be legit, combo that with daily login rewards and daily/weekly XP challenges and baby you got a stew. The issue with this is that people would unlock everything over time without spending a penny. We have to remember this is a 'proper' free to play game and not some RRP priced game with micro transactions in. I agree with the principle that there should be a daily login bonus and something for winning, but I doubt we will see them give the potential for Infinite free packs. Event: everyone's Pathfinder and his grapple has no cool down. That one's free, Respawn. It really bothers me that they removed the sound that the ultimate accelerant made. They did? I used a couple today and didn't notice anything, but I wasn't paying much attention today in general so I definitely could have just missed it. That's just from Lifeline from what I can tell. I think the "apply heals faster" works for the ultimate accelerant with her, and it goes fast enough that it cuts out the click at the end. What a shame. Apex legends had so much potential (and still does). R.i.p in peace 2019-2019. Apex back up to #2 on XBL. I was wondering how Shroud and Disrespect streaming the new BO4 Alcatraz mode would affect things but BO4 stayed the same.